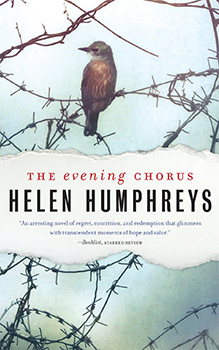 The 2015 CFUW-Hamilton Author Night features Helen Humphreys on Monday, March 16th in the auditorium of Hamilton Public Library, Central Branch (55 York Blvd., Hamilton), starting at 7:30 p.m. The award-winning author will be talking about and reading from her new book, The Evening Chorus, a story about love and war and ways of escape. Tickets are only $10 and are available from Trudi Down, Barbara Ledger and Joanne Curtis, as well as Bryan Prince Bookseller (905-528-4508) (cash only). For Visa and Mastercard purchases please visit us at Eventbrite . A small service charge will apply to all credit card purchases. This is our major fundraiser event for the CFUW-Hamilton Scholarships — please support it in any way you are able. Posters for placing in community centres and retail outlets, and for distribution to other groups to which you belong (especially book group members), are available from Trudi at info@thecorporateword.com or here.